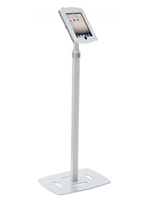 These adjustable locking tablet stands are made of durable steel with a neutral white finish. 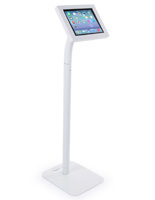 The locking iPad kiosks are height adjustable and can raise the screen from 38" to 67" off the ground. 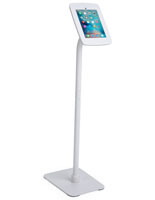 Each of the tablet stands for Apple® second, third, and fourth generation devices are great for retail stores because they are compatible with Square card reader (although the enclosure is compatible with Air 1 & 2 devices, the card reader will not be useable). A lock and key secures the front of the iPad fixture to prevent theft. 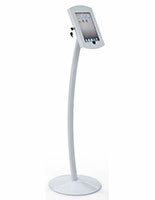 The stands quickly rotate 360° to provide a landscape or portrait view of the screen. 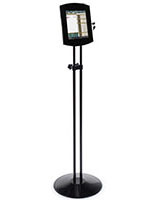 The enclosure features access ports for the audio jack, camera and charging port. 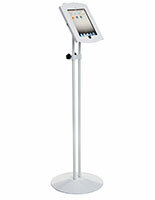 Please Note: This product is designed specifically to hold Apple 2nd, 3rd & 4th generation iPads. We cannot guarantee that this will fit other tablets. 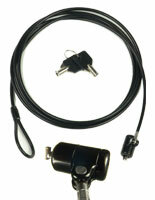 Please Note: This product is designed specifically to hold Apple 2nd, 3rd, 4th generation, and Air 1 & 2 iPads. 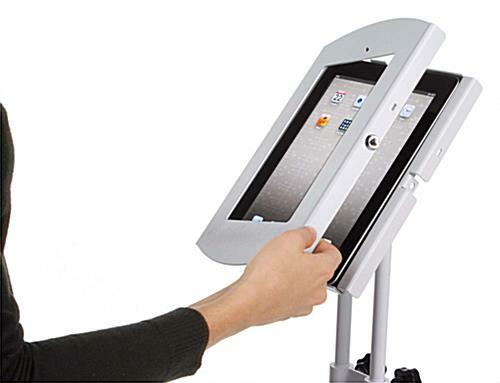 We cannot guarantee that this will fit other tablets. Home button is coved by the enclosure for all compatible devices. Please note: The only card reader compatible with this unit is the Square card reader, but it will not be compatible when used with the iPad Air or iPad Air 2.